Right now thru 6/2 you can score Frank’s RedHot sauce for $0.50 at Target! 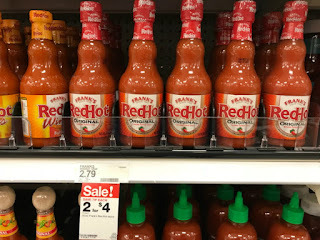 Frank’s RedHot is on sale for $2.00, down from $2.79. Combine the sale price with a new 25% off Cartwheel offer and a manufacturer coupon. After your purchase, submit your receipt for a $0.50 Ibotta rebate offer. You can redeem this offer up to 5 times.